You’ve probably seen a traditional marketing or sales funnel where leads sources appear at the top of the funnel and customers are at the bottom. 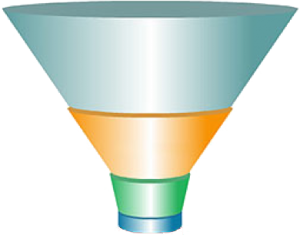 In between, the funnel has been segmented into linear steps, and at each stage a percentage of leads makes it through to the next stage. This traditional marketing approach presupposes a solution for customers without ever understanding their problem. Some leads mysteriously make it through and become customers while others do not. Smart companies compensate by A/B split testing content and messaging to gauge what positively impacts moving prospects through the funnel, but these methods do not properly engage prospects or show you what the new information means for their decision- making process. Think about purchasing a new car. Most people go through a decision-making process in which their opinions change as they learn new information. For example, let’s imagine a prospective car buyer named Bill is in the market for a new electric vehicle. Bill has heard about how these cars help protect the environment and save on fuel, but he doesn’t know many people who have experience with them. So he decides to ask his friends and contacts on his social networks for feedback by sending a request on Twitter and Google+. A few people on Twitter respond and give their opinions about how great it is that Bill is going green. But one current owner of an electric car on Google+ claims that owning an electric vehicle is extremely difficult because there are too few recharging stations and recharging the vehicle at home is not practical. The owner also claims the car lacks acceleration and doesn’t climb hills well. Those possibilities obviously raise some new questions about the efficacy of electric vehicles for a potential buyer, so Bill visits the car manufacturer’s website hoping for some more information. The website has some high- level content about recharging options and a six-month-old map of vehicle recharging stations, but nothing about acceleration or hill climbing. So, Bill decides to e‑mail the car manufacturer to get more information. Luckily, the manufacturer responds, but gives him the phone number of a dealer located one hundred miles away. At this point Bill is ready to give up, but he decides to place the call anyway. After ten minutes on hold with the dealership, Bill is passed to a waiting salesperson. The salesperson seems knowledgeable but can’t answer Bill’s specific questions about fueling stations in his area or why his social network contact was having trouble accelerating and climbing hills. The salesperson asks him to drive a hundred miles to test drive the vehicle and see for himself. But Bill’s had enough. He likes the idea of an all- electric car but he’s already spent too much time trying to get basic information. As a result, he stops in the middle of the car manufacturer’s traditional marketing funnel and doesn’t become a customer. If the electric car manufacturer’s executive team learned about this experience, they’d be justifiably upset. Yet this scenario plays out every day across multiple products and services both in the B2C and B2B spaces. So what’s the solution? The traditional marketing funnel needs an upgrade to support the social era by integrating adaptive, real- time feedback into what I call Darwin’s Social Funnel. Think of Darwin’s Funnel as a series of small improvements that make the organization more effective by learning to be very efficient in adapting to its surroundings. Adding Darwin’s Funnel allows an organization to make real-time adjustments based on real-time feedback. No longer do you need to wait months for the results to trickle in while sales pass you by; you can take a proactive, social approach that enables you to fine-tune the funnel so that it is faster and more fluid. To illustrate how this works, let’s go back to the electric car example. Once Bill made his request for information about the car on Twitter and Google+, a company that is tuned in to certain keywords like “electric car” or “fuel economy” would be instantly alerted to a potential opportunity. At this point, it may make sense for the company to test out a few short messages (using Twitter) or a lengthier response via Google+. The key is to follow and watch Bill’s reaction. If he responds positively, then the company recognizes that this type of engagement was successful in moving Bill to the next stage. If he didn’t respond positively, then the company can either reach out to him directly to ask him a question or try another approach. These small wins and losses become institutional knowledge and make the organization more effective over time. It also prepares the company for the next prospect who displays similar needs. So when Bill receives the bad news from one of his contacts on Google+, the company can decide if it makes sense to jump in and respond to the objection. Perhaps Bill’s contact lives in a city that doesn’t have a lot of recharging stations and has found owning a car in that city impractical. Furthermore, Bill’s source may have bought a model that was underpowered for his needs and should have bought a more powerful electric car. The point is that the company is ready to respond to objections or engage in context with a personal message for the prospect. This creates trust and desirability. You gain deeper insight into whether the prospect intends to buy your product. By having short conversations with prospects on social networks, you gain valuable knowledge that can help you modify your product messaging. Just engaging a prospect via social channels may be the deciding factor in whether or not he buys from you. If the prospect is charmed by your organization, he most likely will refer you to a few of his friends or relatives, thus adding prequalified prospects to the funnel without the company spending large sums of money to do so. Because the most popular social networks (especially Twitter) are open, new potential prospects may begin to inquire about your products and services because they admire how you handle existing prospects. Of course, social business is still business, so you’ll need to measure its performance and its value to your organization. You need to prove the value of any initiative, especially an enterprise-wide transformation. Few executives will make such a move on faith.